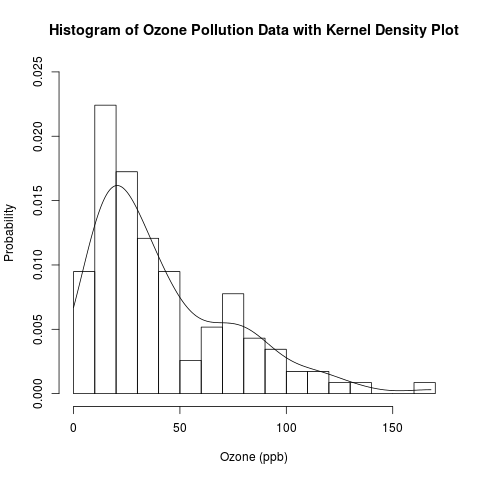 – using the options “from = 0” and “to = max.ozone” or “to = max.ozone2” in the density() function when defining density.ozone and density.ozone2 in the R code. Harlan also noted in the above comment that any truncated kernel density estimator (KDE) from density() in R does not integrate to 1 over its support set. Thanks to Julian Richer Daily for suggesting on AnalyticBridge to scale any truncated kernel density estimator (KDE) from density() by its integral to get a KDE that integrates to 1 over its support set. I have used my own function for trapezoidal integration to do so, and this has been added below. I thank everyone for your patience while I took the time to write a post about numerical integration before posting this correction. I was in the process of moving between jobs and cities when Harlan first brought this issue to my attention, and I had also been planning a major expansion of this blog since then. I am glad that I have finally started a series on numerical integration to provide the conceptual background for the correction of this error, and I hope that they are helpful. I recognize that this is a rather late correction, and I apologize for any confusion. For the sake of brevity, this post has been created from the second half of a previous long post on kernel density estimation. This second half focuses on constructing kernel density plots and rug plots in R. The first half focused on the conceptual foundations of kernel density estimation. This post follows the recent introduction of the conceptual foundations of kernel density estimation. 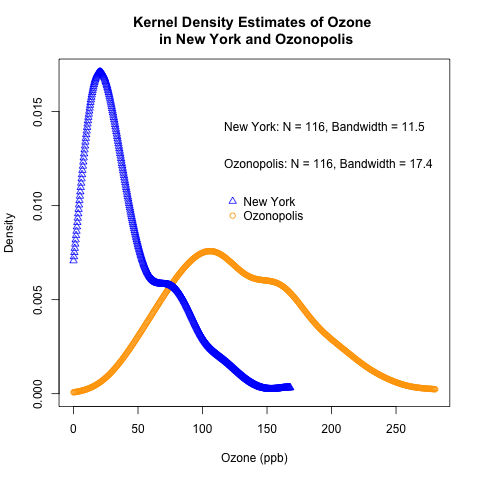 It uses the “Ozone” data from the built-in “airquality” data set in R and the previously simulated ozone data for the fictitious city of “Ozonopolis” to illustrate how to construct kernel density plots in R. It also introduces rug plots, shows how they can complement kernel density plots, and shows how to construct them in R.
This is another post in a recent series on exploratory data analysis, which has included posts on descriptive statistics, box plots, violin plots, the conceptual foundations of empirical cumulative distribution functions (CDFs), and how to plot empirical CDFs in R.
Read the rest of this post to learn how to create the above combination of a kernel density plot and a rug plot! For the sake of brevity, this post has been created from the first half of a previous long post on kernel density estimation. This first half focuses on the conceptual foundations of kernel density estimation. The second half will focus on constructing kernel density plots and rug plots in R.
Recently, I began a series on exploratory data analysis; so far, I have written about computing descriptive statistics and creating box plots in R for a univariate data set with missing values. Today, I will continue this series by introducing the underlying concepts of kernel density estimation, a useful non-parametric technique for visualizing the underlying distribution of a continuous variable. 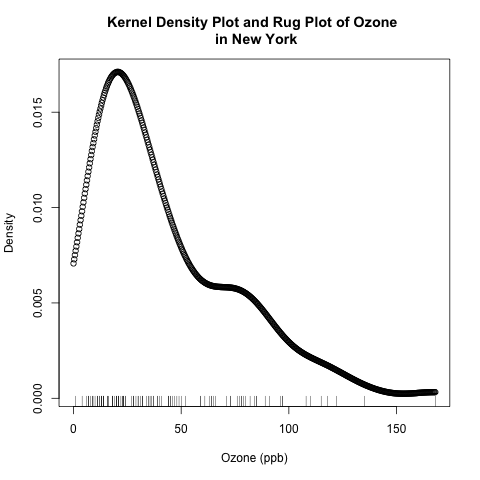 In the follow-up post, I will show how to construct kernel density estimates and plot them in R. I will also introduce rug plots and show how they can complement kernel density plots. But first – read the rest of this post to learn the conceptual foundations of kernel density estimation.